At one time, the Grand Strand boasted more than 120 golf courses. That number in recent years has hovered around 100. But the popularity of chasing that little white ball has helped stretch the Grand Strand’s tradition of summer vacationers into the spring and fall. That’s when the climate here yields the most enjoyable temperatures for golfing. That makes the strand one of the world’s most popular golf destinations. No one seems to know exactly how many golfer visit here each year. But, by using hotel occupancy it can be deduced that 1.3+ million golfers scoot along Grand Strand cart paths every year. Golf has ranked as the number two generator of tourism revenues here since the late nineties. It’s so big, in fact, that golfing legend Gary Player once expressed his belief that to be taken seriously in the golf industry, you had to have a footprint on the Grand Strand. The area takes a serious approach to golf marketing. Many courses have joined to form co-op advertising and marketing efforts. Nearly every course offers special golf package deals. Along with greens fees and cart fees (you are required to ride during busy times) some also include a welcome gifts, breakfast and other meals. The off-season for golf on the strand is the summer months. But, even then, a golfer should make morning or late afternoon tee times in advance as these time periods are the most popular during the hot summer. With some searching golfers can sometimes find courses that expand their summer rates into the late spring and early fall, normal high-fee time periods. This 60-mile stretch of real estate boasts a collection of the country’s finest course layouts. Courses designed by golfing greats like Jones, Player, Nicklaus, Fazio, Palmer, Maples, and Dye. The courses offer a lot more than what you might expect. They’re everything golf fantasies are made of. In its 2007-2008 issue, Golf Digest included 10 Grand Strand courses on their America’s Top 100 Greatest Public Courses list, more than any other golf destination in the country. The highest ranked was the Dunes Golf and Beach Club. It was ranked number 28. The area topography makes for some interesting and diverse golf-hole challenges. Golf Course architects love the diversity. The strand’s pine tree forests, river bluffs, swampland, centuries old oak trees covered in moss and the beach itself, provide seasoned and aspiring golf-course architects with some of the richest natural resources in the world. And not only has Mother Nature given us an abundance of beautiful real estate but has blessed us with a subtropical climate that makes the outdoors pleasant almost every day of the year. Crisp days and blue skies make fall and spring the favored seasons of many golfers. Still, lots of folks are learning the local secret that outrageous bargains can be had during the summer and winter months. The sub-tropical climate here makes golfing a year-round delight (although cold hands in winter and sweaty hands in summer can make putting a greater challenge). The Grand Strand offers golfers the chance to savor both the history and tradition of the sport. Considered the granddaddy of them all, Pine Lakes International Country Club is a semi-private layout designed by Robert White in 1927. It lies near the heart of Myrtle Beach. Many say it single-handedly launched the area onto the national golfing stage. Myrtle Beach’s highly regarded Dunes Golf and Beach Club, carried on the tradition. It was designed in 1948 by Robert Trent Jones, and stands in the ‘restaurant row’ area a few miles north of the Myrtle Beach city center. In decades following, architects competed to outdo each other and the result was a parade of splendid designs. As the number of courses spirals past 100, the area’s popularity soars. Each year the Grand Strand hosts a wide variety of events and tournaments designed to satisfy every kind of golfer. 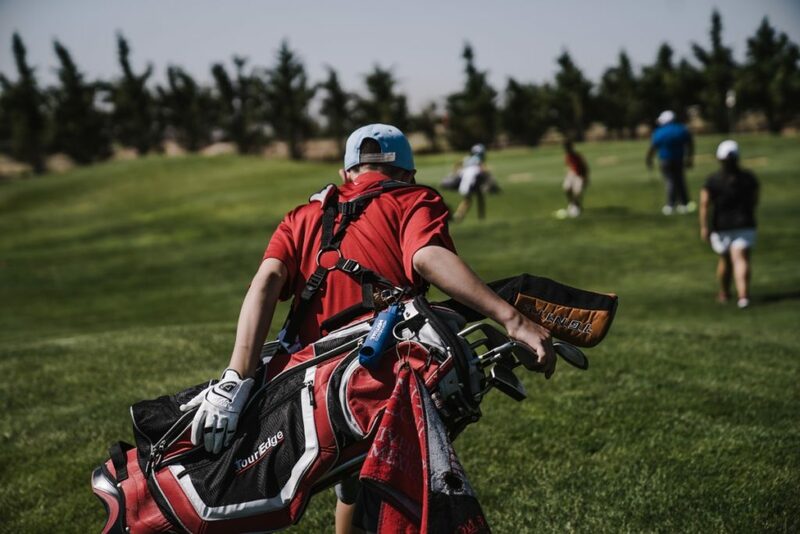 Annual golfing excursions to the stand have become a regular event for hundreds of thousands of golfers and their families. Here, the strand caters to golfer and non-golfer making the area an easy choice for family vacations.